Needles and Hooks and Books, Oh My! : WIP Wednesday: I'm knitting again! 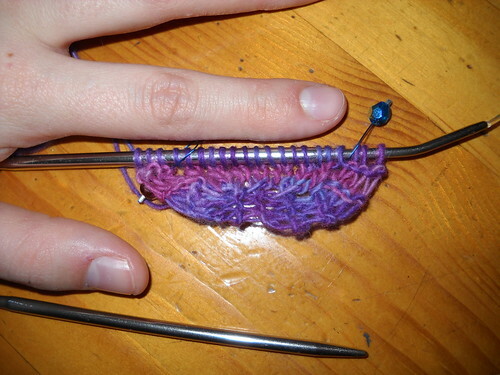 This week, I'm back to working on a knitting project. My last project that I got on and off the needles was my first lace shawl, the Holden Shawlette. I moved on from there to some crocheted shawls and shawlettes. I've had the Citron shawl/ette in my queue on Ravelry for quite some time, as I wasn't working on a lot of knitting, as I am a slow knitter. However, I ordered some undyed lace weight yarn at the end of the year, and it came in the mail a few days ago. I wanted to dye it straight away. As I started the dyeing process, I started to look for a pattern. Lo and behold, the Citron was knit in a lace weight yarn! Yay! It's not very big, but I've also been working on some stash busting projects that I will show on Friday. To see more WIPs, head on over to Tami's Amis! I really like the colors of the yarn. Cant wait to see how it works up. Looks good so far, I am yet to knit a shawl and would love to know how you get on! Love the colour too! Gorgeous colours; it's going to be sooooo pretty! oooh that will look fab in that colour. Love the color - great job on the dyeing! Pretty colour yarn you have there, the shawl should turn out very pretty. There's always groaning from someone- but don't let it stop you! Dyeing is so much fun, and if you do it with food dyes, it's cheaper and safer.